HOLLIS – The snow is dripping away here in Southern New Hampshire, but Hollis Brookline High School alpine ski champion Stephanie Menard isn’t about to hang the skis up just yet. And why wouldn’t the Cavaliers’ junior? With the ski-racing winter she’s had, you can understand why Menard wouldn’t want it to end. Competing for the HB team, Menard won 6 of the 10 races held during the regular season at Crotched Mountain. 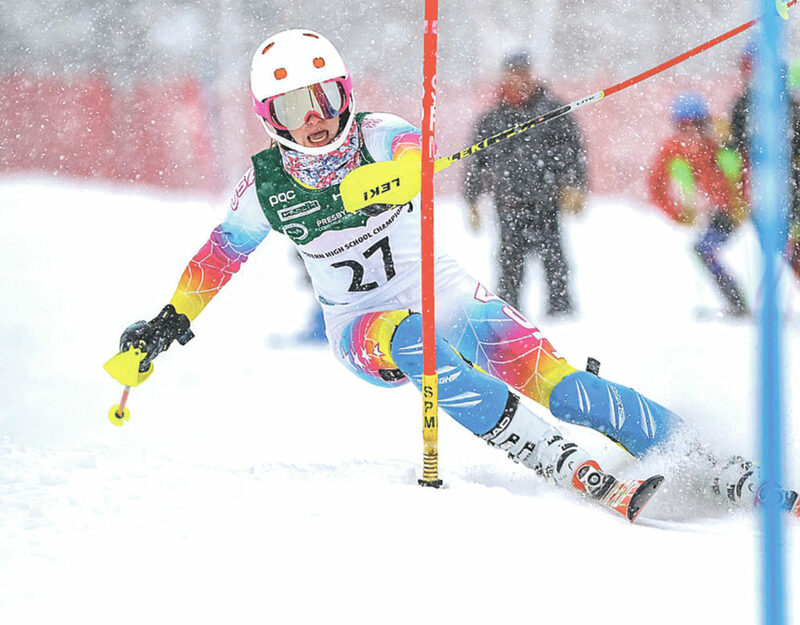 Menard took the slalom titles at Division II state meet and the Southern N.H. Meet. At the Meet of Champions, she posted the greatest highlight of her season, beating the field in giant slalom, which really isn’t her specialty. Menard went on to represent Team New Hampshire, capping her season at Eastern Regionals (all states east of the Mississippi) and took ninth in the slalom there. It was a huge high school year, but only a fraction of what has become the busiest of winter seasons. “Being so competitive, you put in a lot of practice and a lot of time spent at the mountain,” said Menard, who also races weekends for the club team at Loon. “During the week, we train at Crotched Mountain, and that’s basically 45 minutes from our school. On the weekends, it’s up to Loon, where the team hits the hill first thing in the morning. Of course, Menard would have it no other way. About 10 years ago, she fell in love with skiing, but first tried to compete as a freestyler. “I really didn’t like freestyle, but I knew how much I liked skiing, so we tried racing,” she said. Menard, now 17, never looked back. She and her twin sister Isabelle chose to stay home and attend HBHS instead of looking into the ski academy route. Both Menard girls wanted to remain well-rounded. And while skiing forces some sacrifices — “I didn’t get to go to our championship basketball games this winter, and I wish I could have,” Stephanie said — they’ve accomplished their goals. Both girls played varsity soccer in the fall and are partners in the spring with the school’s unified track team. In addition, Stephanie is a straight-A student, taking a course load that includes an AP class and three honors courses. Still, she’s always on the go. “If I didn’t love it, I wouldn’t still be doing it,” she said. Like most juniors, Stephanie is already looking to that next step. She’s talking about potentially studying medicine. But the recent success on the slopes has added a new dynamic to the equation. There’s plenty of time to think about that, though. Menard still has another year-plus to take on the rigors and joys of high school. And she has Isabelle right with her, taking every step. The competitiveness certainly flows on the slopes. While Stephanie grabbed the headlines, Isabelle was no slouch, taking seventh at the state meet in slalom. Stephanie says the two are very close, competitively speaking.